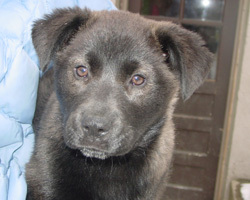 Sunny is one of 7 puppies whose mom is a Golden Retriever and Dad is hmm, something black and fuzzy. 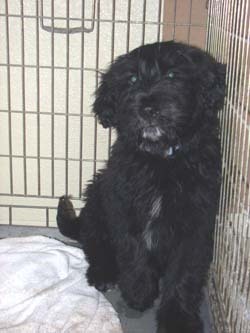 He is a sweet pup with a soft black coat and gorgeous brown eyes and just a little white on his chin. He will make someone very happy. He's a very friendly, affectionate pup. 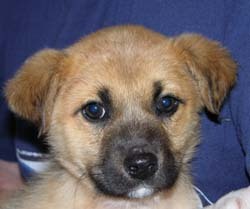 Sadie is the runt of a litter of 7 puppies who are 12 weeks old. Mama is a purebred Golden (Mandy) and Dad must have been a terrier as they have fuzzy faces, possibly Poodle (Golden-doodles?). She is an adorable pup, sweet and lovely. Her fur is soft and wavey and very silky, like most of her siblings. Some of the pups have white on their chins or on their chest. Chopper is a 3 year old male Min Pin/Doxie mix. Here are some notes on him from his owner. He knows how to sit, he smiles, she kept his leash in a basket on the floor and when she mentioned going for a walk and asked him to get his leash, most of the time he would get it and bring it to her (might need some coaxing). He sits at door when he needs to pee, absolutely love to play with a ball and will retrieve. He is not good with kids (has snapped at 3 children before but the children not being nice to him). Also if you hold one of his bones in your mouth, he will very gently take it out for himself. He loves to ride in the car. Adult home only. Phoenix is a healthy 3 year old black Lab Mix (neutered male) who was given up by his owner who was a medical student and away for long hours. He is great with other dogs, friendly, and sweet. He weighs 55 pounds and is up-to-date on all preventative health care (including heartworm prevention). Because he was directly turned in by his owner, we have his complete medical history. He was a well cared for dog and his gorgeous coat shows it. He looks scared in the picture, but it was taken shortly after his arrival and he does get timid in new situations, but then he bonds quickly. 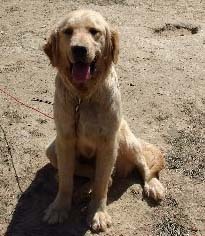 Phoenix is a fence jumper so will do best in an environment where he is leash walked or on invisible fence. He is a quiet, sweet dog who will be someone's best friend and companion. He does not jump up or have any bad habits. A really nice dog who is timid at first, but then is the most loveable dog on earth when he bonds to you. 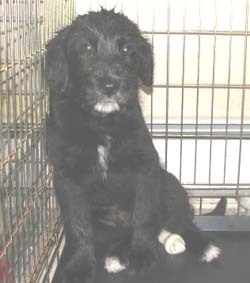 Sparky is one of 7 puppies whose mom is a Golden Retriever and Dad is hmm, something black and fuzzy. He is a sweet pup with a soft curly coat and gorgeous brown eyes. He will make someone very happy. He's a very friendly, affectionate pup. 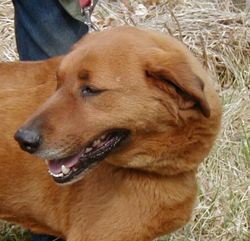 Yankee is a retriever mix who is about 3-4 years old. He seems to be a Golden/hound mix. Yankee was originally from an abuse case where the owner had many dogs crammed into a little trailer. He was emaciated when he was first rescued by Monroe County Animal League and they did a beautiful job fattening him up. He is very out going in his foster home. He enjoys daily walks, especially in the woods, and loves being sung to. No matter the tune or the voice. He has grown during his time with us. Would love to be a couch potato, as long as he can share his couch with someone to love on him. If there's another dog he will hog the couch, though. He gets along great with other dogs. He gets too excited around cats. He wouldn’t mean to hurt them – he just isn’t aware of his size. Very playful and enthusiastic and wants to please. Check out the new pictures a photography student took of him. 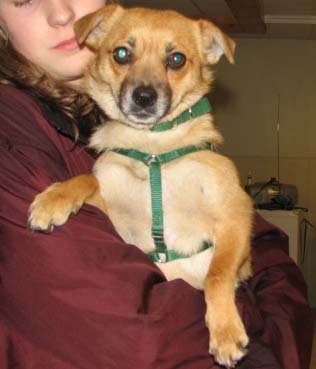 Cleo is a small female Chihuahua mix (looks like some feist too, which is another small breed). Anyway, she is a 13 lb. ball of energy. She's 18 months and loves to play with everybody, dogs and cats. She will be available after 4/16/07. 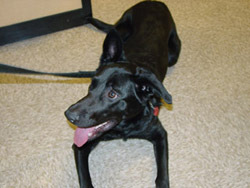 Sammy is a ten-month-old spayed female Shepherd/Lab mix, who was relinquished because her owner didn’t have enough time to properly exercise her. She had a second family with a fenced in yard, but she was too much for the nine year old son, so we have her back. Sammy has since received extensive training from her foster home and she is very well trained. She can even ride the "T" and sits quietly at your side. She walks nicely on leash and is a general couch potato in the house, plus she's very well housebroken. Sammy looks like a black lab with standup ears. Her ears are so cute, they stick together in one point. 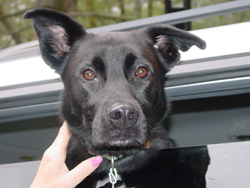 She is friendly, smart, affectionate, loves tennis balls, and loveable. Sammy is tall and lanky and athletic. Sammy knows some basic commands; sit and down, and because she is so smart, with the right owner, she could be quite impressive in the obedience department! She listens and is very obedient. Sometimes she jumps up when she is excited so she would need older or bigger kids if she were to go with a family. 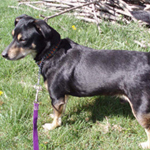 She is great with other dogs, and has lived with cats, and kids, but only teens please. She's a really intelligent dog and should be a wonderful companion for the right person willing to keep up the training. Shepherd experience would be wonderful! She weighs 60 lbs. Dixie is a seven year old Husky mix who is in a tough situation. She was adopted from Save A Dog and has had a wonderful life getting daily jogs and lots of attn from her owners. But they now have a toddler and another one on the way, so she is not getting the attention or walks she used to so has resorted to jumping the fence. She is an awesome dog, good with kids, friendly with everyone. She is still with her owner and will be available to meet once we receive your application. Samuel is one of a litter of 7 puppies who are 12 weeks old. Mama is a purebred Golden (Mandy) and Dad must have been a terrier as they have fuzzy faces, possibly Poodle (Golden-doodles?). He is an adorable pup, sweet and soft and gentle in nature. His fur is soft and very silky, with some white on his chin, his feet and on his chest. 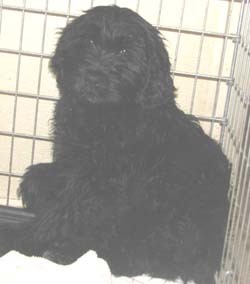 If you didn't know better, you would think he was a Portuguese Water Dog. He will be available after 4/16/07. Please apply online under How to Adopt on our Web site. Eloise is an Australian Shepherd, possibly mixed with Border Collie or Poodle. She is coming with her brother, Ernie. They are arriving on 4/14/07 and will be available after 4/16/07. Ron is an 8 week old puppy who was found abandoned underneath a church. They had to dig him out. He weighs 13 lbs. He was with a dog who looks like a Shepherd/Collie/Golden/Beagle, who knows what he is, just a cute pup with big white paws and the cutest face you'll ever see. He is good in his crate and goes to the bathroom outside already. He arrived on 4/14/07 and will be available after 4/16/07. 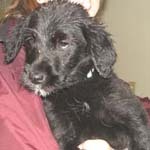 Tulip is a mixed breed stray puppy, 8 weeks old, who was found running across a busy highway. She appears to have some collie/husky/shepherd. We're not sure yet, but will update this description when we figure it out. She's totally adorable, though. She is arriving on 4/14/07 and will be available after 4/16/07. 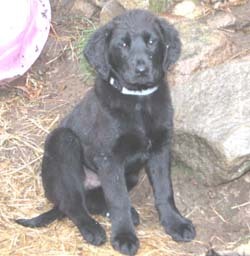 Sarah is one of 7 puppies whose mom is a Golden Retriever and Dad is hmm, something black and fuzzy. She is a sweet pup with a soft wavey coat and gorgeous brown eyes and will make someone very happy. She is very gentle, although somewhat shy. Ernie is an Australian Shepherd, possibly mixed with Border Collie or Poodle. He is coming with his sister, Eloise. They are arriving on 4/14/07 and will be available after 4/16/07. 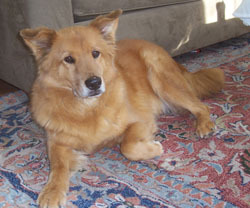 Jack is a six year old Chow mix who needs a new home as his current one has many small children including a new baby. He is good with kids but his family is just overwhelmed. His coloring and temperment are like a golden retriever. He is a very sweet and loyal dog who loves attention and especially loves a good back rub. He is a friendly dog, but can be timid with men when he first meets them. He is very good with children (he currently lives with 2 toddlers and a newborn), cats, and other dogs. He loves to play, but is not overly physical and will not jump on people. He is house trained and crate trained and loves to take walks on a leash. He has been trained to an invisible fence, but may need some refresher training. Jack does take some medication that would need to be continued. He is currently taking Phenobarbitol which is an anti-seizure medication. He had seizures a year ago, but has not had one since being on the medication. Jack is a very special dog who loves to cuddle and although he is 50 lbs, he will crawl into your lap if given the opportunity. He is still with his owner, but private arrangements can be made to meet him once we receive your application. 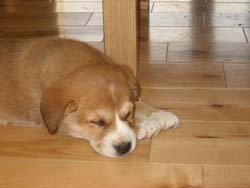 Mandy was dropped off at a humane society in rural WV along with her six puppies. She is drop dead gorgeous and we're sure we will have many applications for her, but please look at our other dogs too as we won't have any trouble placing her from the applications already on file. 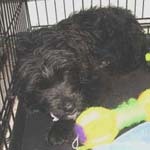 She will be arriving, along with her pups, on 4/14/07, then will need to be spayed later in the week. She will need to recover after the spay so should not go into a very active household who wants to run her right away. She will need 10 days of quiet so we will seek the appropriate home who can offer her that. Goldens are beautiful dogs, but they are high maintenance in terms of their coat and exercise requirements and need to be with the family and not left at home to their own devices. When retrievers get bored and anxious, they chew to relieve the stress. Midnight and her sister, Osa, are female pups, about 12 weeks old. They were two of three dropped in someone's driveway in a rural town in Union, WV. They are here are are very sweet and adorable. They will be available after Tuesday, the 20th. 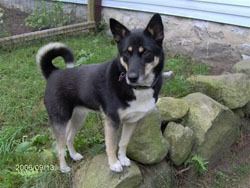 Midnight has a thick dark coat with light highlights and Osa has a lighter coat with blonde hightlights. Samantha is one of a litter of 7 puppies who are 12 weeks old. Mama is a purebred Golden (Mandy) and Dad must have been a terrier as they have fuzzy faces, possibly Poodle (Golden-doodles?). She is an adorable pup, sweet and lovely. Her fur is soft and wavey and very silky, like most of her siblings. Some of the pups have white on their chins or on their chest. She will be available after 4/16/07. Please apply online under How to Adopt on our Web site. 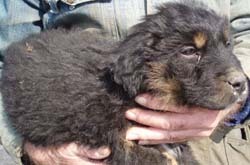 Sidney is one of 7 puppies whose mom is a Golden Retriever and Dad is hmm, something black and fuzzy. 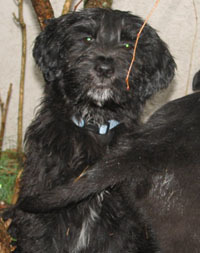 He is a sweet pup with a soft black coat and gorgeous brown eyes. His coat is shorter than the other pups.